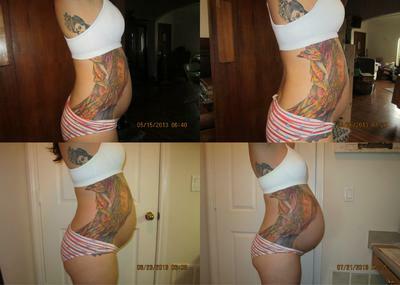 I think it's awesome that your body is stretching your tattoo to look like a pregnant woman! You look beautiful! I think you advanced very gracefully. I am 11 weeks pregnant with twins I am so afraid to get to 20 weeks. Say good bye to that beautiful tattoo. You look beautiful though, your body is doing something amazing! !